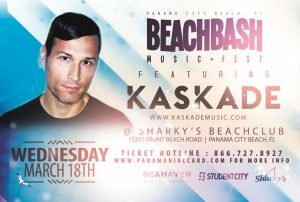 Kaskade will perform live at the Beach Bash Music Fest on March 18. 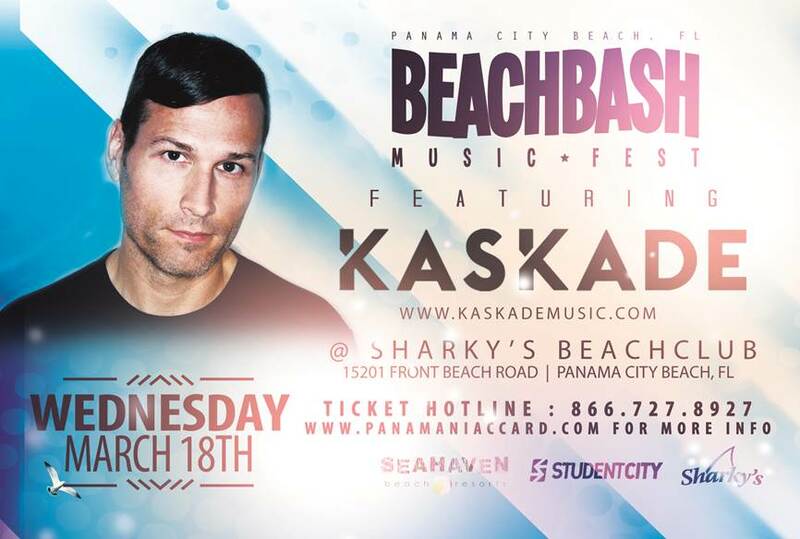 World renowned EDM artist ‘Kaskade’ has been booked to perform live in Panama City Beach, FL during Spring Break at the Beach Bash Music Fest this March. Doors will open at 10AM and will feature multiple opening acts. Kaskade has been named America’s number one DJ by DJ Times and Pioneer DJ, and he’s currently EDM’s most sought-after ambassador and one of its most beloved figures. In a recent profile, The New York Times called Kaskade the “new face of electronic dance music”, but the real truth is he’s been in the trenches of the EDM scene as an original recording artist and in-demand DJ for more than a decade. He’s released seven studio albums, including his latest 2011 release Fire & Ice; scored numerous Top 10 hits on Billboard’s Hot Dance Airplay Chart; created chart-topping remixes for everyone from Lady Gaga to Beyoncé; and, in addition to appearing at all the major summer festivals, has performed between 150 and 200 headlining shows a year for the last 10 years. Just two weeks ago, CMG Media announced that Diplo – another popular and extremely successful DJ – would be headlining the Beach Bash Music Fest on March 10. Last year, top EDM sensation Steve Aoki was booked and played to a record number of people for a ticketed daytime beach event. The Beach Bash Music Fest at Sharky’s Beach Club is sponsored in part by Joose Margarita. Each event runs from 10AM to 6PM. This is a ticketed event that features the largest stage on the beach. Tickets for this event can be purchased by logging onto www.panamaniacclubcard.com/events. There are only a limited amount of tickets available, and this event will sell out. Early-bird tickets are available for $29.99 each as well as VIP tickets for $49.99. Receive priority entry when booking your hotel stay at Seahaven Beach Resorts – the official hotel partner of the Beach Bash Music Fest. Growing up in the Chicago suburbs, Ryan Raddon, known as Kaskade, was always into music, but it was hearing New Wave bands like The Cure, Echo and the Bunnymen, and The Smiths that ignited his love for melody and lyrics. He was also strongly impacted by the house music scene that had developed in Chicago. The former skateboarder has been known to show up at gigs in flip-flops but that is in no way indicative of how seriously he takes creating his music. His recorded output includes multiple singles, EPs, and remixes, as well as albums – his most recent being the 2011 release Fire & Ice which debuted at No. 1 on the Billboard Dance chart, No. 3 on the Independent Albums chart, and No. 17 on the Top 200 Albums chart.